Santa Rosa, CA - The Napa- Sonoma region of California lies just an hour north of San Francisco and is renowned for the world class wines produced at the many vintners that dot this rolling landscape. During the summer months, the roads are lined with acres of vines and one can see the precious grapes fattening up in the hot sun. In every direction wineries offer the pleasant escape of tours and wine tastings that have made this region a Mecca for travelers. This area is not only a marvelous place to sample the nectar of the gods, it also offers great golf courses to pass an afternoon on. 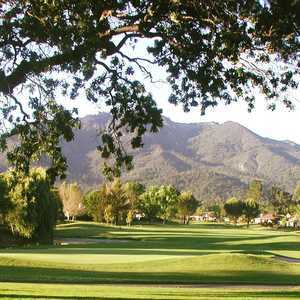 One such course, Fountaingrove Resort and Country Club in Santa Rosa is one of the best in the region. Fountaingrove was built in 1985 as the cornerstone of a vast real estate complex that encompasses 1800 acres. The property used to be the location of the Fountaingrove, a well known Japanese commune established in the early 20th century. This oriental heritage became part of the theme of the original development and is evident in the architecture and landscaping at the club. This project was visionary in its scope at that time and tried to be all things at once. Along with the golf course, the project included private home sites, condominium complexes, industrial park, hotel, and shopping plaza. The scope of the project is one that probably can't be duplicated now as a slow growth approach to Sonoma County's future would make getting approvals for this type of development difficult. 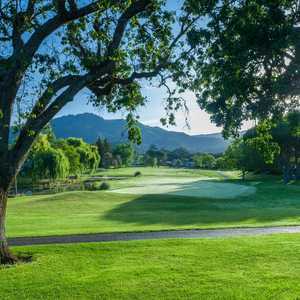 The setting for Fountaingrove Golf Club is stunning as the course rests along the rolling hillsides of live oak and golden grass that offer a great contrast to the green fairways and brilliant white sand bunkers. Course architect Ted Robinson spent weeks hiking through these golden hills to develop a routing that used the varied elevations to their best advantage. His layout captures the drama of the setting with a variety of uphill and downhill holes that also offer inspiring views of the surrounding countryside. When the golf course opened in 1985, golfers were enthusiastic about the challenging layout. New ownership bought the project in 1996 and their plans looked to take Fountaingrove to the next level. The hope was to build a plush resort hotel on the hill overlooking the 10th hole and make this a true destination resort. As a key to this expansion, the owners completely renovated the course and actually closed it down for nine months in order to upgrade its conditioning. The addition of a new irrigation system, a better drainage system, new sand for bunkers, and input from architect Robinson on a new ninth hole were all put into place. The result has been to bring Fountaingrove up to be one of the best-manicured and maintained courses in the Sonoma-Napa region. Going north on Route 101 through Santa Rosa you take the Mendocino Road exit and turn left into Fountaingrove. As you arrive at the Japanese style gatehouse, you grab the first glimpse of the original design style of the resort. The three story clubhouse and restaurant sits on the hill and offers a commanding view of the course and the city of Santa Rosa spread out below. This view gets juices flowing as the course shines below you. 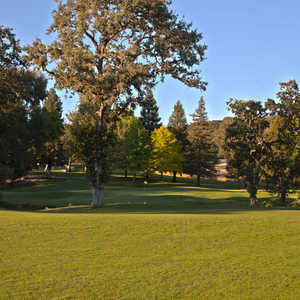 Fountaingrove Golf and Country Club is a private club that accepts public play. Even though it has been here since 1985, at the moment there are only165 members of the club. Outside players cannot make tee times until 48 hours in advance but there never seems to be a problem to secure a time. In fact, this course is the great secret of the region. I played on a Saturday and was one of only five groups playing in the afternoon. This is unheard of in the Bay Area where it seems that sleeping in your car in the parking lot is the only to get on most golf courses. From the staff members that greet you at the gate, the valets that drive up to the clubhouse, and the staff at the pro shop, every effort is made to treat guests as though they were members themselves. The relaxed and efficient approach helps to set you at ease here. Fountaingrove has four tees and plays form 5,424 yards to 9,649 yards from the tips, but the course plays best from the blue tees at 9,439 yards, and with a slope of 131 it has plenty of challenge. This course winds through the oaks and climbs all the way through the front nine which puts a real premium on iron play here. The first tee sets the stage for this nine. From an elevated tee box that is framed by oaks and a lovely rock wall, a large oak protects the left edge of the fairway. If you can draw your ball to the center of the fairway you can leave yourself an uphill approach to a two tiered green. Uphill shots and undulating greens seem to be the call for this nine. The course also puts you on your toes quickly as the 2nd hole is the number 1 handicap hole. This uphill 379-yard hole demands a big drive to get you in position to reach the very elevated green. After making this climb, you reach a valley where five holes sweep through the oaks. These holes have few houses around them and wildlife thrives in this area. Deer, wild turkey, red tail hawks, and rabbits are found in abundance here. The natural areas to the left of the 3rd hole are one of the features that were added during the renovation of the course and provides excellent natural habitat. The first par five on the course, #4, is only 490 yards long but is a double dogleg with the green well protected by both oaks and bunkers. Again, positioning is important to have a great angle into the green. By now you have noticed that the greens are bent grass with invasive poa throughout, but the care of the greens strives to keep the poa in check. The surfaces are true and quick from the summer heat. The last three holes on the nine bring you from the highest point on the course back to the clubhouse. The 7th is a downhill par 4 of 340 yards with a lake in front of the green to put just a bit more pressure on the approach shot. A three wood from the tee is a smart play as the water can be reached with a bit hit. Number 8 is a long downhill par five, that at 583 yards, takes three great shots to reach. But number 9,a 148-yard par three, is a unique wrap up to the nine. This hole was completely redesigned to add the creek and wetlands to the hole. It is a wonderful blending of elements to create a beautiful golf hole. The back nine turns the course into a strategy course as the terrain forces the holes into a tighter play through the hill and trees. The opener at ten is a gorgeous hole as it peels off of the hill by the clubhouse. The view of the lakes, the geese, the oaks, and Santa Rosa in the background makes you want to just hit away here. This hole is 370 yards long but it is the last hole that is obvious from the tee on this nine. The cleaver, and at the same time diabolical, trait on this nine is that each hole gets a bit tighter than the last. 11 is a par five that is totally blind from the tee. You have to take two long shots with faith down the middle to set up for the green that is protected by a huge oak tree. From here on in, make sure that you really think out your shots as each shot has strategically positioned trees coming into play. Two other holes, 15 and 16, both have blind tee shots where the green is nowhere to be seen. And each fairway gets progressively narrower putting more premiums on accuracy with each shot. The 17th hole is a downhill 200-yard par 3 that is the signature hole of the course. A large lake fronts a smallish green and a bunker protects the left side. This is a beautiful setting but it demands a great golf shot. The finishing hole plays back towards the hill where the clubhouse sits. Plans are to put a hotel on the right side of this hill. This a majestic view with nine, 18, and ten all in view form the tee. The finisher is 361 yards long and a big drive puts you just short of the creek that cuts through the fairway. This green is deep and undulating so check the pin placement before making your club selection. This is a great finisher that puts a capper on a very memorable golf course. If you are planning a trip to the wine country, Santa Rosa makes a perfect place to base your stay. Nearby Highway 12 runs from Santa Rosa to Napa and passes through the Valley Of the Moon and the heart of the wine region. Lodging is available at the Fountaingrove Inn and the Sonoma Hilton Hotel which are both less than a mile from Fountaingrove Golf Club. $95 Saturday and Sunday which includes cart and driving range. This article is years old- this club has been private for years - no public play. That is not the Club's current name. Some surrounding business listed in the article were destroyed by fire.